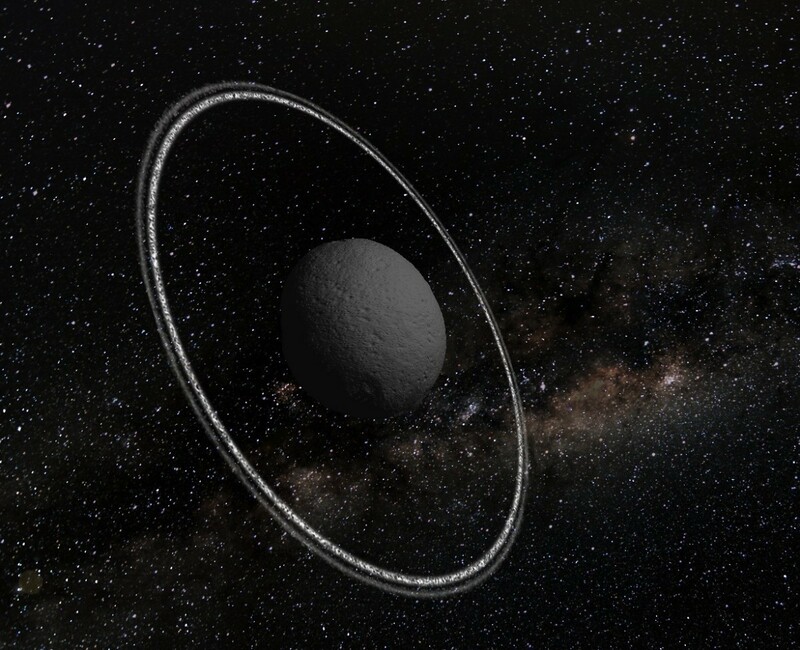 Astronomers have found an asteroid with a ring system, and the results have been published Nature. While this is the first discovery of a ring system about an asteroid, such a thing isn’t entirely unexpected. We have known for a while that asteroids can have moons, for example. But what’s particularly interesting is how they discovered these rings. The asteroid in question is known as Chariklo, a 130 kilometer wide object that orbits between the orbits of Saturn and Uranus. It is the largest example of the Centaur group, which are likely Kuiper belt objects that were captured by the gravitational pull of the outer planets. 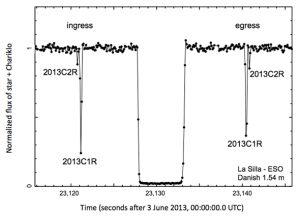 In the Summer of 2013, Chariklo passed in front of a dim, 12th-magnitude star as seen from parts of South America. 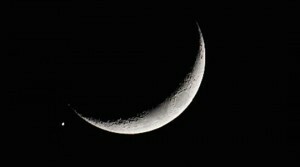 It is a phenomenon known as an occultation. Brightness of the background star during occultation. Credit: F. Braga-Ribas, B. Sicardy, et al. Such an event is a great opportunity to better determine the size and shape of an asteroid, so a team of astronomers dispersed through Brazil, Argentina, Uruguay and Chile made observations of the occultation. Since each observation is made from a different vantage point, Chariklo’s occultation of the background star occurs at a slightly different orientation. By combining these different observations the team could map the overall shape of the asteroid. But what the team found was that from some vantage points the background star dimmed a couple times before being occulted by Chariklo, then dimmed a couple times after the occultation as well. 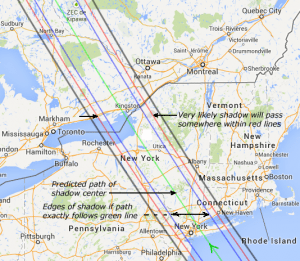 Analysis of these pre and post dips makes it pretty clear that there are at least two rings around the asteroid. Knowing that Chariklo has a ring system, the team was also able to determine a bit about the composition of the rings. As Chariklo (or any other ringed object) orbits the Sun, there are times when the rings are seen more edge on, and times when we see more of the rings. The team compared spectral observations of the asteroid between 1997 and 2008, and found that the asteroid gradually dimmed during that period. The observation of water ice in the spectrum also faded during that period. This would be consistent with a ring system containing ice (which is very reflective) gradually shifting to an edge-on orientation. One of the more surprising aspects of the discovery is that the rings are so sharp and dense. Typically a ring system would diffuse over time unless there are shepherd moons to keep the rings in order. So it may be that Chariklo has not only a ring system, but a moon system as well. To determine whether that is the case, it will likely take some high resolution imaging. But that remains to be seen. Paper: F. Braga-Ribas, B. Sicardy, et al. A ring system detected around the Centaur (10199) Chariklo. Nature (2014) doi:10.1038/nature13155.